CIRECA, a leader in spectroscopy-based tissue diagnostic technologies, announces an advancement in an alternative method for multi-class classification of immune response. The methodology developed at CIRECA, referred to as SHP_CIRECATM, has proven to be scalable between different diseases, and for different study aims. Based on the studies performed, the results have shown that the classification accuracy between normal and cancerous tissue by SHP_CIRECA of lung and breast cancer is 99% and 94%, respectively. These significant findings along with other information will be presented at SPEC 2018, the International Conference on Clinical Vibrational Spectroscopy which brings together industry leaders developing instrumentation and techniques to improve world health and patient care. 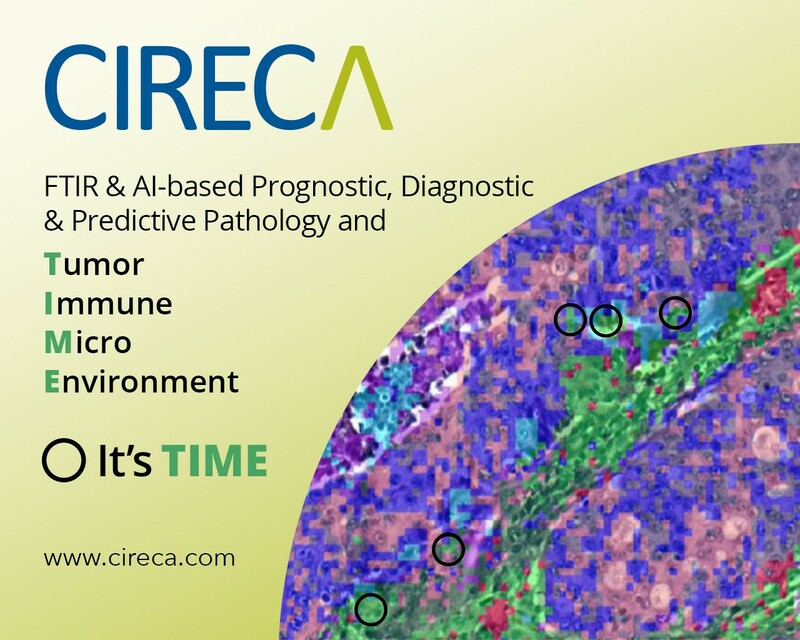 Founded in 2011, CIRECA is the leader in IR-spectroscopy-based tissue imaging for immuno-oncology applications, to characterize the tumor microenvironment and for diagnostics. As a decision support technology, CIRECA’s advanced spatial analysis and spectral-multiplex technology is applied to identify diseased cells at earlier stages of progression and to objectively measure response to therapy. The technology works by detecting biochemical signatures, and by delivering more information per sample, rapidly and at the lowest cost. CIRECA is working toward meeting future demands where more personalized and effective treatments are required to advance patient outcomes by providing new insights and discovery into tumors, microenvironments, and biomarkers.